Note: If you are new to reference variables, read Reference Variables Anonymous objects before reading this. Reference variables vs Objects is very confusing while creating array objects as an array. Observe the following code. 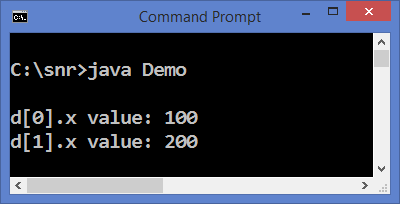 Many people think, in the above statement, two array objects of Demo class are created. It is wrong. The statement creates two reference variables of Demo class. That is, d and d are reference variables and not objects. They must be converted into objects before used. That is what is done in the following statements. Now, d and d are full-fledged objects and can be used in the program as you like. Pass your comments and suggestions to improve this tutorial on "Confusion of reference variables vs objects in arrays". excellent sir, i hava done msc(cs) through distance education(annamalai university). and 33 years old. i dont have any experience in software field. worked as computer teacher in blor. now i completed diploma in java(java and advance java). if i want to try in software industry, how to improve more technical knowledge to get job. please guide me. You must be through with aptitude, reasoning, communication skills etc. Also know C and C++ and Java (upto struts). Then apply to jobs.